American Paper Optics has manufactured millions of 3-D glasses and viewers made to exact specification for every imaginable product packaging application. Our amazing optics can be incorporated as in-pack or on-pack premium items. Let American Paper Optics help you with your next new product launch, marketing campaign or promotion. 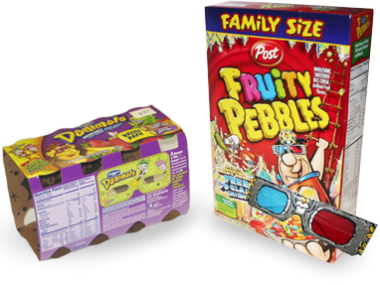 Our 3-D glasses have been included with yogurt, soft drinks, cereal, comic books, markers, coloring books and kid's meals. Dannon Yogurt incorporated more than 14 million 3D mini-viewers for an in-pack 3D promotion for "Danimals®." We can manufacture 3D glasses or 3-D viewers for any conceivable packaging situation. The possibilities are endless! Give us a call and we'll help drive your next product or premium vehicle into the next dimension with 3D!